Windex axial fans are specially designed for the use on ships. 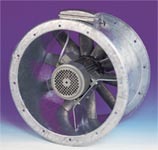 The fans are suitable for duct-mounting, but they can also be mounted directly on or under deck. The fans can keep functioning optimal, under all circumstances. They have a high efficiency, as a result of which the shaft power is low. Non standard voltages, frequencies, various isolation classes and explosion proof motors are available on request. The casing is manufactured from high tensile steel and provided with a motor base and flanges. The whole is standard delivered in a full galvanized construction. Through carefully profiled blades and an optimum hub ratio, a high aerodynamic efficiency is achieved. The profiled blades are die-cast in an extremely corrosion and wear resistant aluminium alloy, and can be adjusted in angle while stationary. The connection of the fan takes directly place on the mounted on the outside of the casing. Please download the pdf for more information about double-speed regulation and technical data. And call or email us for details and an offer.